The enclosures that house fiber optic cable need to be custom designed for every single setup in order to ensure the wires lay properly and don’t become tangled or compromised. 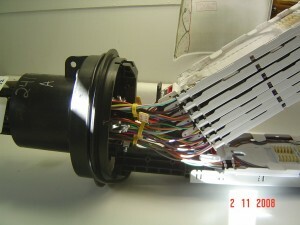 This is one area in which the experts from Connected Fiber excel, and you’ll know when you see the pictures below that our attention to detail and neatness go a long way in getting tons of tiny wires to fit and stay in their designed configuration. From micro wall boxes which can be placed inside a cowl to massive enclosures that hold large amounts of fiber-optic cable, we’ll design an enclosure to suit both your needs and the workspace. Many times, especially with larger enclosures, you may want to leave room for expansion, limiting the number of fibers inserted into each tray, and leaving room in the enclosure for an additional tray can mean the difference between an upgraded setup and a full replacement when the time comes. Our tagging and color coding systems make finding the area you’re looking for easy, and expediting repairs when necessary. 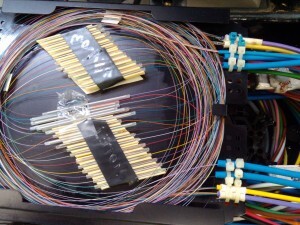 Custom setups are our specialty at Connected Fiber, so call us today and let us get started on an aesthetically and functionally pleasing fiber-optic network for you. Here is an example of one of our enclosures. We have a basket for buffer tube storage, we try not to splice more than 48 fibers per tray for the aesthetics and future expansion of laterals. Chips are identified by the color of the tubes spliced and stored in them. 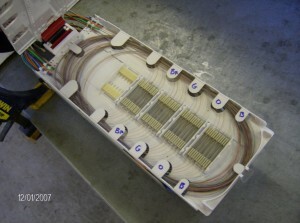 This tray was designed for 24 splices; the yellow and violet are spliced thru. 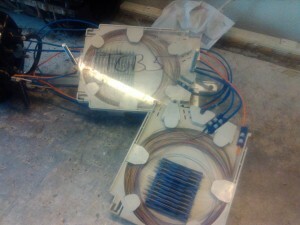 Then a mux or CWDM was installed which puts the tray above capacity (these were siliconed). The plastic keeps the silicon from adhering to the tray lid. Our techs do usually have spare adhesive chips available. 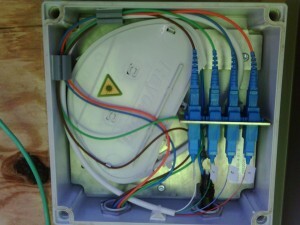 This is a micro wall box, place inside a cowl box used at some call sites. The cable entered thru the bottom of our tubes, enters the tray behind the jumpers which has the numbered connector jumpers going to the bulkhead. The Color pigtails were installed by others activating the site. Here is an example of a coyote pup or 6.5 x 17 dome enclosure with 2 trays; TCB5 is Traffic Control Box 5. This is missing the L clamps for the strength member retention. In this case, we had so many tubes of fiber here we could not use a slack storage basket and every tray holder had a tray. Notice the felt on the tubes and labels on the cables on the inside as well. Here is a Tyco Gel enclosure we built at a Fiber Distribution Hub. We tag the tubes with small ty wrap labels when we install laterals but we always label feed and distribution cables to make identification easy if ever reentered.